X-Train Fit has done it again - presenting RIPT90 FIT! This is a complete 90 day system incorporating resistance interval plyometric training, so you really get the most out of each workout. 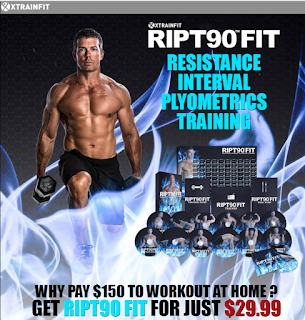 RIPT90 FIT includes 12 workouts on 12 DVDs and a BONUS Stretch workout on its own DVD, a complete training guide, a complete meal guide with recipes, a 90 day tracker, and a rotation calendar poster. The system is designed to provide maximum results in 30 minutes or less per day! Led by Jody Hendrix, RIPT90 FIT is designed to help you avoid plateaus and takes RIPT 90 to a whole new intensity! These are all new workouts that are more intense than RIPT90 but just as awesome! Read all of my RIPT90 FIT Reviews on the blog. Jody leads this 11 min bonus stretch routine with 3 backgrounders in a gym set. You will need a PVC pipe or broom stick for this routine. Stretches include PVC pipe chest opener, around the world stretch, tri & delt stretches, yoga pushups to down dog, nice kneeling bi & chest stretch, ham stretch, hip flexor & hip openers, modified pigeon, butterfly pose, and childs pose. This routine is appropriate and recommended for all fitness levels. This is an athletic style stretch with a few yoga poses. I love the use of the PVC pipe to really enhance the stretches. I have also used a stretchy exercise band instead and it worked very well.I use this quick stretch routine all the time. It really does help & hits all muscle groups. I received this DVD to review.